R U A Running Fool? Today is April Fool’s Day - a day notoriously known for pranks and jokes. Except this is real. For TODAY ONLY on April 1, all Historic Half Weekend and Run Amuck Weekend events are 10% off by using code: RUNNINGFOOL19. Historic Half: A 13.1-mile course perfectly situated halfway between the capital of the Commonwealth in Richmond and the nation’s capital. The hugely popular event through historic Fredericksburg is a fashionable spring weekend getaway with the added attraction of having to scale Hospital Hill. Marines line the course and the finish, just as you'd expect from a Marine Corps Marathon-organized event. Semper 5ive: A five mile distance run hosted on the same morning as the Half, beginning closer to the picturesque downtown. Devil Dog Double: 18.1-mile course requires runners to first complete the Semper 5ive before embarking on the Historic Half. One Day. Two Distances. Three Medals. Run Amuck: Attack mud trenches, lumber through a low crawl and indulge in a super sloppy mud pit. These are just three of more than 20 challenges that await participants along a hilly course. Tackle it as a fierce competitor or indulge in family fun. Earn a finisher coin. Belleau Wood 8K: The Battle of Belleau Wood, during WWI, earned the Marines the nickname "Teufel Hunden" or "Devil Dogs.” In a test of individual tenacity, the Belleau Wood 8K will send runners to the woods and onto the trails of Quantico. Earn a finisher medal. Recon Ruck: Choose the harder thing and ruck it. The Recon Ruck sends participants into Quantico's hills, trails and roadways for a 12-mile journey while wearing a weighted pack. Earn a special finisher patch. Crossroads Challenge: Featuring two of the day’s events for the opportunity to earn a prized medal – Run or Ruck, then Amuck. In order to qualify for this accolade, runners must complete the Recon Ruck OR Belleau Wood 8K and then participate in Run Amuck. Double the challenge, double the reward. No need to pinch yourself – there's no foolin' here. Historic Half and Run Amuck registrations might be ten percent off but the experiences that await you throughout the course and at the finish are more than you can imagine. 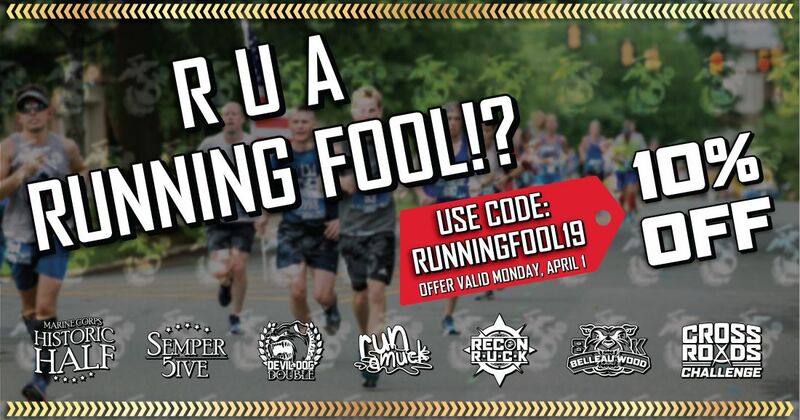 If you are a running fool, you must take advantage of this offer today and #RunWithTheMarines. Remember to use code: RUNNINGFOOL19.